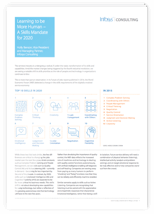 Learning to be More Human - A Skills Mandate for 2020 - Infosys Consulting - One hub. Many perspectives. The services industry is undergoing a radical, if under-the-radar, transformation of its skills and capabilities. Amid the market changes being triggered by the fourth industrial revolution, we are seeing a notable shift in skills priorities as the role of people and technology in organizations continues to blur. While these two lists look similar, the few differences are critical to changing the jobs market over the next few years. Amid constants such as Complex Problem Solving and People Management, we see skills such as Quality Control (#6) and Active Listening (#9) – currently in demand – becoming far less important by the end of the decade. 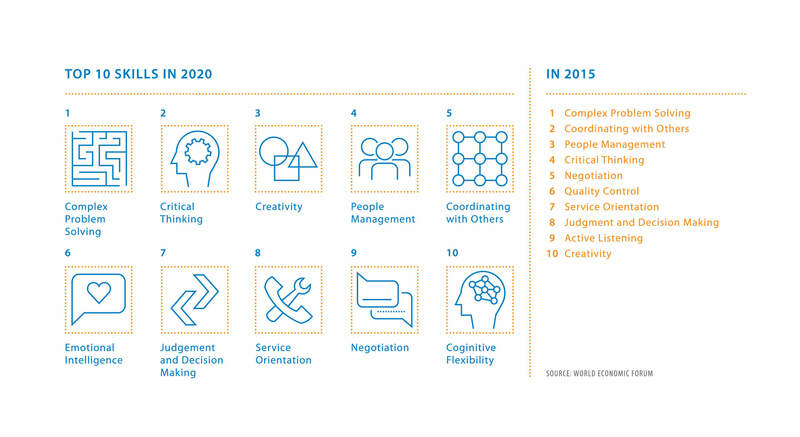 In contrast, by 2020, skills such as Emotional Intelligence (#6) and Cognitive Flexibility (#10) are expected to be far more critical to business needs. This skills shift is not about developing new capabilities for using technology, but rather a reflection of the growing autonomous role that technology will have in the next few years. Rather than devaluing the importance of quality control, the WEF data reflects the increased role of machines and technology in dealing with quality control functions autonomously, with artificial intelligence enabling self-diagnosis and self-healing. Companies are veering away from paying as many humans to perform “checking” and “fixing” functions now that they can be reliably and efficiently machine-enabled. Similar scenarios apply to skills such as Active Listening. Companies are recognizing that listening must be paired with the appreciative and empathetic responses that characterize Emotional Intelligence, rather than being a skill in isolation. Future service delivery will need a combination of physical behavior (listening), intellectual activity (analysis and problem solving), and on-target emotional response to be truly effective and to help companies stand out from the crowd. Superior service demands agility, which is why we are seeing Cognitive Flexibility emerge as a top 10 skill for 2020. Who hasn’t been infuriated by a call center agent who seems capable only of reading a script, rather than answering your specific question? The user experience we all now expect is an on-demand, personalized and conversational one. Service providers must be able to think on their feet and seamlessly shift gears between intellectual activities and possible solution sets. While some industries are rising to the challenge, it is not enough. These are not skills easily taught in a classroom, let alone online. They require on-the-job training in order to establish context and real-world cognitive responses. Shrinking corporate training budgets are mostly targeted at issues of scalability, speed, reusability, and automation in learning programs. These are good attributes, although not conducive to developing deep, compound, multi-faceted, experiential skills such as emotional intelligence and cognitive flexibility. Millennials have extremely short attention spans for in-depth training, and most new technologies are so intuitive that they eliminate the need for it. Consequently, companies are getting rusty in developing and delivering complex, in-depth training curricula. Collectively, we are finding innovative solutions to our tactical training needs. We are using Massive Open Online Courses (MOOCs) to enrich our employees’ knowledge, gamification to drive near-term tactical changes, and even artificial intelligence to power interactive online content with many of the same attributes as personalized instructor interaction. However, things like emotional intelligence or cognitive flexibility are closer to a practice than a skill and so require a degree of instinctive reaction or “muscle memory”. 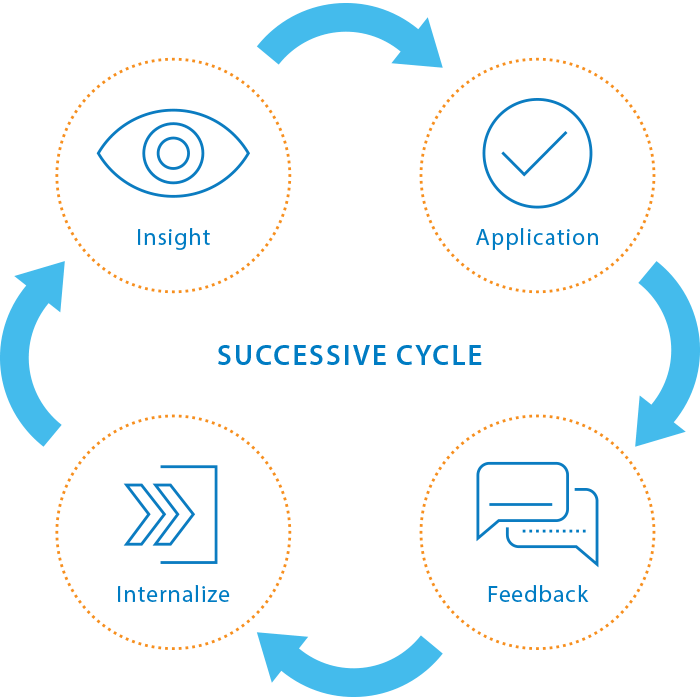 They are built up through successive cycles of insight, application, feedback and internalization. A current Infosys Consulting learning program for a similarly complex area – design thinking – offers some ideas for how to actually achieve this in many organizations. Like emotional intelligence or cognitive flexibility, design thinking requires a shift in personal mindset alongside retraining conditioned responses. It insists that before rushing into problemsolving, we pause to reflect on and explore the real needs and emotions of users. This is so we can find ways to approach designing solutions from a human-centric, rather than a process, technology, or financial angle. It also requires that we abandon our fear of failure and criticism, and open ourselves up to successive cycles of prototyping, testing and feedback. This will allow us to optimally tune a solution to the real-world needs of the target user. It is a complex, compound skill which combines listening, empathy, creativity, facilitation, and prototyping abilities, among others. It is also something that Infosys has trained over 100,000 employees in over the past 18 months. We have not only taught them how to complete a design exercise, but also sought to reframe their entire approach to problem-solving and client interaction. This called for a combination of face-to-face instruction, ongoing on-the-job practice and application, and creation of a supportive, reinforcing environment. 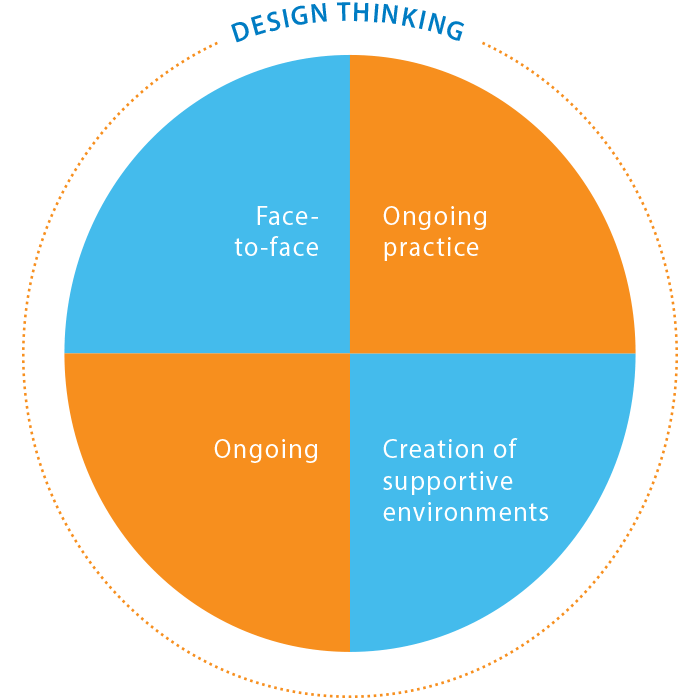 Design thinking has enabled the organization to remove internal roadblocks, improve client service, identify new technological innovations, and help clients improve their own agility and innovation. We believe this four-part approach – instruction, practice, ongoing application, and creation of critical mass in supportive environments – are essential to building up this complex skill. A similar approach is necessary when organizations tackle emotional intelligence or cognitive flexibility skills development. 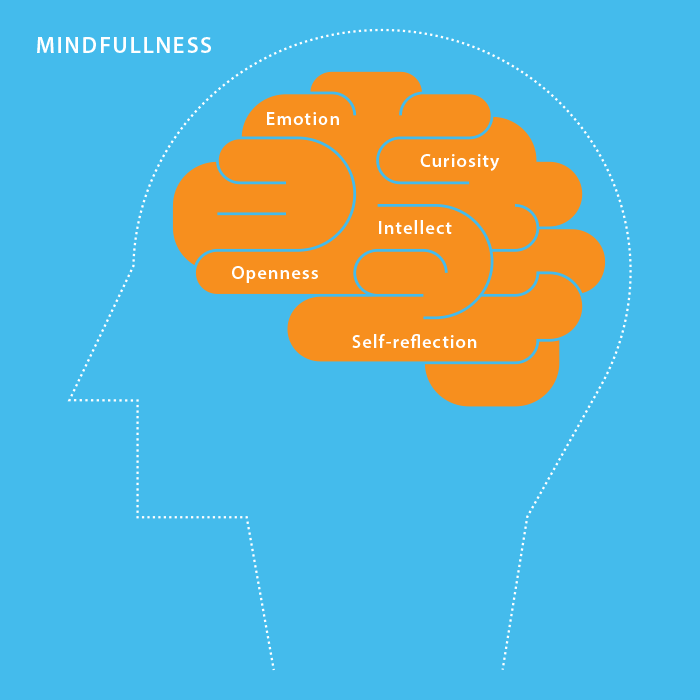 On a final note, we see one other fascinating influence on the development of deep compound skills – mindfulness. It inherently helps develop intellect, emotion, self-reflection, curiosity, openness and other attributes which fuel emotional intelligence and cognitive flexibility. A decade ago, the topic of mindfulness was reserved for spiritual or meditative practice. Today, there are whole conferences dedicated to mindfulness in business, and mainstream companies are investing in introducing mindfulness to their organizations. Google, LinkedIn, Facebook, Aetna, Ford, Eileen Fisher, Twitter, Slack, and Kaiser Permanente, just for starters, have all spoken publicly on this topic and on the positive impact it has had on their organizations. These companies alone showcase the mainstream nature of mindfulness in modern business. The top 10 skills the workforce and employers need as we approach 2020 are not about technology. Instead they reflect the need for better interaction between people. It’s a great time for all of us in business to rethink how we will develop the complex, compound skills required to meet customers’ rising expectations on service and user experience, and to support our employees in building them. Holly brings the scientist’s curiosity and observational skills to the world around her. She uses her interactions with some of the world’s leading corporations – and their workforces – to form fresh and intriguing insights on education and skills. 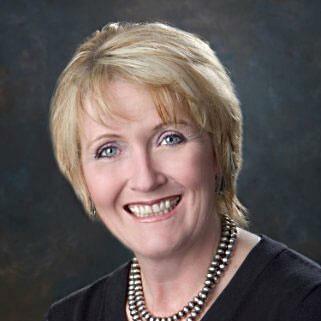 After 25 years’ consulting experience she remains a hands-on practitioner who helps clients deal with people and organizational implications of agile enterprise and changing business models. She is developing and delivering learning programs, both for Infosys Consulting and its clients that grapple with the challenges and opportunities provided by technology in the learning space. Holly is now bringing this perspective to the World Economic Forum, as steering committee member of their Global Future Council System Initiative on Education, Gender and Work. Customer focus as the key to efficient and successful customer service in the telecommunications industry. Fintechs and a rapidly evolving regulatory environment is challenging the traditional talent landscape for banks.